Yoga has been traditionally practiced barefoot. It helps us feel more grounded, balance more easily, and build strength in our toes and feet. But what is the solution if even the grippiest yoga mat can sometimes let you down when things get hot and sweaty? If you’re sliding and feeling unstable and wobbly in some postures, these non-slip yoga socks will come to the rescue. Meet our top pick – breathable and stylish yoga socks designed for both men and women that offer superior grip and comfort for better, safer and more hygienic practice. STYLISH DESIGN - Not your typical hospital sock. These unique designs and colors look as good as they feel. SAFETY - Our grip tread pattern on the bottom was created for maximum surface coverage for those slick wood and tile floors. MULTIPLE USES - Best for physical therapy, yoga, martial arts, athletics, hunting, gym, lounging, and wearing inside your hiking or ski/snow boarding boots. Yoga socks are an ingenious yoga accessory that is designed to have non-slip silicone or rubber nubs on the bottom to prevent slipping and sliding on your yoga mat and offer extra safety during the practice on sleek surfaces when you don’t have your mat at hand. Thanks to their versatility, yoga socks are also often referred to as barre or Pilates socks. They come in various styles and lengths, from long tube socks to low cut toe-less designs, and are available in multiple colors and patterns. Yoga socks are surely not a prerequisite for a successful and satisfying yoga practice, but they can significantly help yogis gain confidence in some poses and thus sink deeper without the fear of slipping and falling. However, the advantages of wearing yoga socks extend far beyond the extra grip. Here are some of the additional benefits yoga socks bring into your yoga routine. Protect Your Feet. Unless you do yoga at home, there’s always a chance of catching some nasty foot bacteria. Yoga studios usually follow a strict no-shoe policy so if walking on the studio floor or exercising barefoot on the rented mat gives you creeps, yoga socks can provide you with a piece of mind by safeguarding your skin against fungus and other viruses. Keep You Warm. Whether it’s winter season or the studio’s AC is running at full blast, some people tend to get chilly during their yoga class. I personally get cold feet all year round no matter the temperature outside. Yoga socks will keep your feet snug and warm so that you could shift your entire attention to the practice. Wick Away Sweat. Yoga socks will keep your feet cool and dry during the vigorous flow and absorb the excess sweat for ultimate comfort. Allow You To Hold Poses Longer. Slipping in Downward Facing Dog or Warrior usually means your body doesn’t have enough strength yet. Yoga socks offer you an advantage of extra traction so you could focus on breath, alignment, hold the poses longer and gradually build the necessary muscle strength. Make Yoga Practice On The Road Easy. I absolutely love my Manduka eKO yoga mat. But I don’t feel like toting it or a yoga towel around with me on my travels. Since I don’t want to stop practicing either, yoga socks offer a lightweight alternative for a safer non-slip practice on hotel tile and wooden floors or even on moist grass in the garden. Keep You Covered. Yoga socks come in handy if you just don’t like to practice barefoot or you want to cover your feet from everyone’s sight because of a particular health issue, for example. When choosing yoga socks, take into consideration what type of yoga you practice and what it is that you’re expecting from this yoga accessory. For instance, if you want to stay warm during the practice, opt for ankle-length and closed-finger style; if you need the socks to do yoga, Pilates or any other activity while traveling, take a closer look at the open half-foot or half-toe style that will be lightweight and will take no space in your suitcase. Generally, there are four things you might want to consider when looking for a perfect pair of yoga socks: fabric, style, grips, and size. High-quality yoga socks will be made of breathable fabric that will absorb sweat and prevent it from dripping on the mat during the active practice. Yoga socks are now made of both natural materials such as cotton and bamboo as well as synthetic fibers. Though there isn’t much of a difference between them, cotton and bamboo tend to have a softer feel whereas the latter is a popular material for high-performance clothing and might offer better moisture wicking and anti-bacterial properties. From knee-length to open foot, you can now find almost every type of yoga socks on e-commerce websites. Apart from traditional tube style, yoga socks can come with toe separators that help spread your toes in certain poses, though these might feel slightly uncomfortable at first and are challenging to put on. All yoga socks feature an anti-skid bottom whether in the form of heel-to-toe dotted pattern, lines or unique pattern. Dots are generally slightly tougher on your feet, especially on hard surfaces. While some people may find the gentle ‘dotted’ foot massage pleasant, those who are sensitive to bumps and lumps might be more happy with flat anti-slip skids. Some yoga socks are super stretchy and fit most of the sizes whereas others come in multiple size options for men and women. Yoga socks should sit tight and gently hug your feet without twisting so pay close attention to the sizing before making a purchase. Always read the manufacturer’s washing instructions before cleaning your yoga accessories and props. While some of the yoga socks can be put in the washing machine, others require hand washing and will last you longer. I recommend washing your yoga socks by hand and in cold water at all times to protect the integrity of the material and grip surface. If you do want to clean your yoga socks in the washing machine, always turn them inside out and wash on the gentle cycle. Avoid adding fabric softener, do not tumble dry, bleach or iron your yoga socks. Anti-Skid Socks: The non-slip silicone gel grips on the bottom, keeping you steady on slippery surfaces, giving you enhanced balance and stability. it's a nice workout accessories, also a perfect gifts for patients, pregnant mothers, seniors or someone who doing yoga, pilates, ballet, dance. These half-toe yoga socks from Hylaea are not only affordable but also stylish and super versatile. They will make Hand-to-Big-Toe poses easier as well as allow you to feel more balanced in your standing postures due to their half-toe design. By hugging your every finger, these socks are also excellent at absorbing sweat during the vigorous flow and preventing the growth of bacteria. The nubs at the bottom are incredibly grippy, according to users, and promote better stability and safety during every exercise whether it’s yoga, Pilates or barre. On the downside, be prepared to come to your class earlier than usual – Hylaea yoga socks can be difficult to put on, especially if you’re in a hurry. Some users have also noted that the socks might sometimes pull back the skin between your toes in certain ‘long-hold’ poses. Available in 3 sizes and several colors, Hylaea yoga socks also come with a free bag for convenient storage, transport, and washing. And if in any case, you’re not completely satisfied with your new yoga accessory, the company will issue a refund or send a replacement if you return the product within 30 days from the purchase. TOESOX: Low rise toe socks hug your foot below the ankle and features ToeSox patented non slip sole for secure footing on any surface. Perfect grip sock for Yoga, Pilates and Barre. Made with super soft, organic cotton in a variety of great colors. DESIGN: The low rise socks have a low profile design that fits right below the ankle, making this an ideal sock for barefoot exercise activities including barre, pilates, yoga, piyo, kickboxing, and dance. The raised heel tab pads your Achilles tendon. GRIP: Attain perfect poses with the Low Rise grip sock. The fitted heel eliminates bunching and twisting while the five toe design encourages toes to spread easily. The arch band provides gentle pressure to lift and support your feet during exercise. Designed to “spread love and toes,” ToeSox are not just your average yoga socks. They strive to make your practice more hygienic, more balanced, and more stable with their construction and design. TeoSox product features patented non-slip sole with the grips going all the way from the back of the heel to the tips of your toes, fitted heel to prevent sock bunching, raised heel tab offering extra cushion for Achilles tendon and arch band for additional feet support. Though ToeSox socks are slightly more pricey than their competitors, you will most probably want to get two pairs anyway. Because who wouldn’t? There are more than 30 colors and studio-to-street patterns as well as multiple sizes so that you could find your perfect fit. Shift your focus from your feet and Be Mindful in our non-slip ankle grip socks. These low-cut socks can be worn by most women, stretching to fit sizes 6 through 10, for any occasion--yoga, Pilates, Barre, or just to putter around the house in comfort. We improve grip and reduce slippage through a combination of Y-heel construction and non-slip grips on the sole. Socks are constructed with a reinforced toe and heel for extra durability, letting you enjoy your socks for as long as possible. 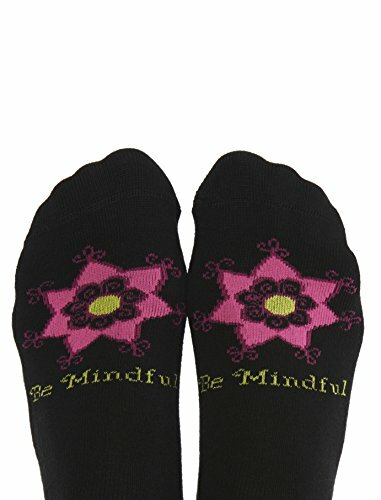 Toe Talk yoga socks will give the dose of inspiration and motivation in the middle of your yoga or Pilates class thanks to their cute design featuring “Be Mindful” message on the top. Made of a soft combed cotton blend, these socks will comfortably fit the women’s sizes 6-9 to keep your feet hygienic, warm and snug. The non-slip pattern on the bottom is inspired by yoga and grips as good as it looks. Toe Talk yoga socks are slightly thin but feature a reinforced toe and heel for durability as well as hand-linked toe seam and Y heel for superior comfort and fit. And the best thing is that the company donates 1$ from each pair to the charity of your choice. USAGE: Keep your calves warm during barefoot workouts including Pilates, Barre, Yoga, Dance, Martial Arts, Gymnastics, and more. GRIP: Our grips really stick even after multiple uses and washes. We keep you connected to the mat, machine or floor. If you like to stand out, Tucketts high yoga socks might be exactly what you need. With their bright and unique patterns, these toe-less yoga socks will not only attract attention but keep your feet hygienic and calves warm for maximum comfort. Tucketts yoga socks are made of cotton blended with nylon and spandex so your socks will retain their shape after wearing and wick away sweat during the intense workout. The toeless design ensures a better tactile sensation during the practice on the mat, and grippy soles will prevent you from slipping on any other surfaces. Unlike other yoga socks that forcefully spread your toes, Tucketts offers only one separation between your big toe and smaller toes, allowing for more freedom and eliminating the problem of the cloth cutting in between your toe webs. Mind that these yoga socks run slightly small so consider ordering a size up. These women’s yoga socks will make you feel like ballerina thanks to their crisscross strap stylish design. 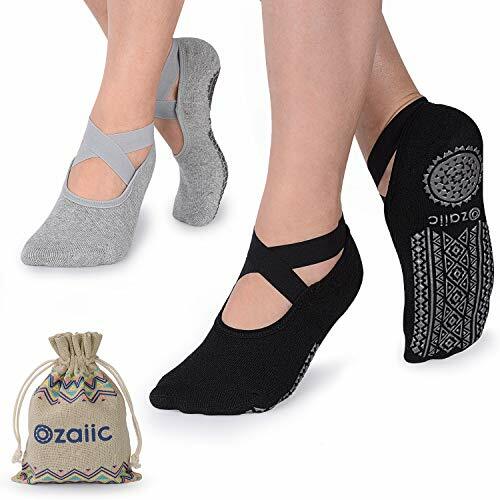 Made of 100% combed cotton, yoga socks from Ozaiic are super soft and comfortable to wear whether you’re heading to your yoga, Pilates or barre class and you’ll probably won’t want to take them off at home as well. The anti-skid silicon bottom grips offer more stability and confidence during your practice on your mat, tile floor or even carpet. Despite all the advantages, these yoga socks come in ‘one size fits all’ design, which can easily turn into ‘one size fits none.’ Some users have found the socks to be too large or wide for their feet. The straps, though cute-looking, might break sooner than the sock itself thus making it impossible to use in the first place. Ozaiic might be a good choice for those who are not really into toe socks, which are more versatile but nevertheless might cause some unpleasant sensations for some people. Moreover, these yoga socks come in pairs, there are tons of colors to choose from, and every purchase comes with a free storage bag. Among the yoga socks for men, Muezna product stands out with its affordable price and high quality. Their non-slip yoga socks are made of the blend of combed cotton and spandex, making the socks soft and stretchy at the same time. Featuring heel-to-toe silicone grips, Muezna socks prevent slipping and fall during yoga, Thai Chi or other exercises. You can also take the socks to your fitness class or gym – thanks to the mesh construction, the socks promote air circulation so that your feet could breathe and stay dry even during the most vigorous activity. Make sure to double-check the sizing and order a size (or even two) up since these socks tend to run small. Though, if you did happen to make a mistake, the company will refund your order without questions asked with 60 days of the purchase. High quality natural cotton blend keeps your feet cool and comfortable with less bulk. Made of 75% Cotton | 23% Polyester | 2% Elastane - M/L- comfortably fits mens shoe sizes 9-12. 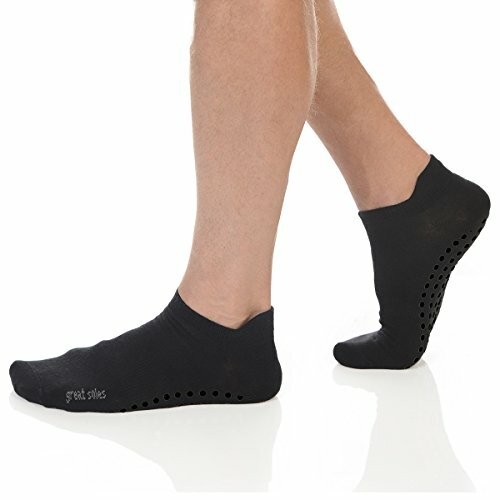 Low cut athletic lifestyle sport sock with superior silicon dot technology for security and control with a "never-slip" heel strip to keep your sock in place. Available in 2 sizes, these Great Soles yoga socks will fit most men thanks to their ability to stretch and gently hug the foot. They maintain a perfect balance between thickness and thinness so you can wear them all year and to any activity, whether it’s yoga, Pilates or a sweat-inducing gym or kickboxing training. Thanks to the raised heel, these yoga socks support your Achilles tendon and the bottom nubs as well as heel grips inside of the sock offer better stability for your foot and keep it in place even during the active movements. What’s more, you can buy Great Soles yoga socks risk-free thanks to the company’s 90-day refund or replacement policy. 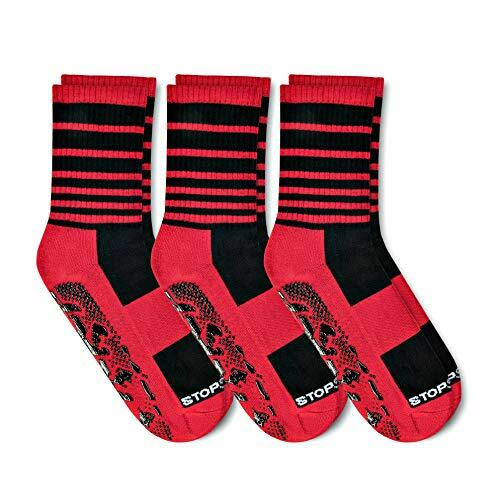 Stay focused on the task at hand and not your feet with our non-slip socks. Socks can be worn by most men, stretching to fit sizes 6 through 10.5, for any occasion--yoga, weight lifting, mixed martial arts, meditation or just to putter around the house in comfort. 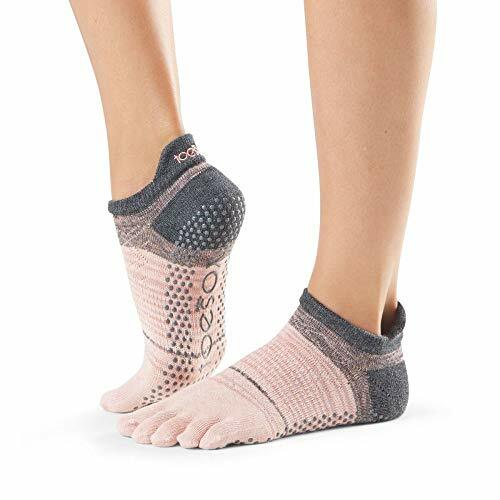 With the Toe Talks non-slip yoga socks, you will now be able to focus on your practice instead of your feet thanks to the rubber nubs on the bottom and the terry cloth cushioning protecting you from unpleasant sensations on the hard surfaces. Made of a stretchy cotton blend, Toe Talks socks are designed with Y-heel to prevent any bunching or twisting during active movements as well as secured in place by multiple ribbed arched bands. The toe and heel are reinforced for better durability and can withstand more hours of vigorous use. Toe Talks yoga socks stretch to fit the men’s sizes 6-10.5 and come in a free bag for convenient storage and washing. Made of thick polyester blend and knee-high length, StopSocks will work great for those chilly winter days when you need some extra warmth during your yoga class. Thanks to tread-patterned anti-skid bottoms, StopSocks will minimize the slipping and sliding during your practice so that you could feel safe in the trickiest poses. 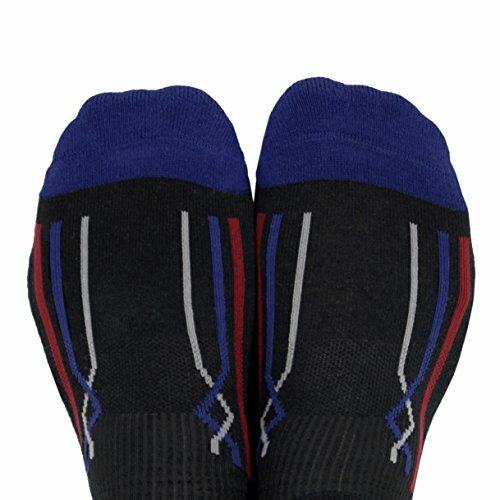 The socks are designed for both men and women but, according to users, run slightly small and tight so order a size up. Some people have also found the tops of the socks a tad too tight for them, so keep in mind that they will probably be a better fit for yogis with skinny legs. 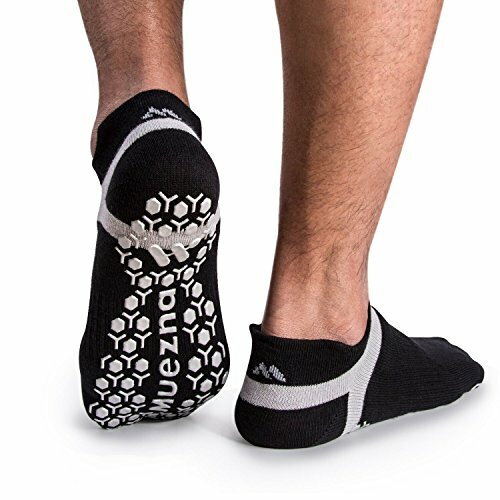 These Grip Tread yoga socks do exactly what they are supposed to do without any unnecessary décor. Made of polyester and spandex blend, they are thick and durable, keeping your feet warm but at the same time letting them breathe during the workout. Thanks to traction rubber sole, you can feel stable and safe not only on your mat but on slick surfaces such as tile or wood. Moreover, you don’t have to worry about the unpleasant sensations of the grippers on the bottom – there is extra padding that cushions your soles when you’re working out on the hard floors. 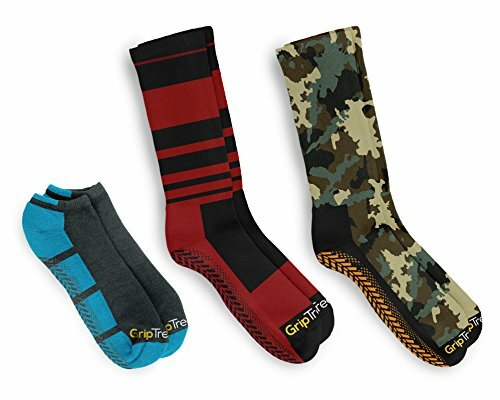 Grip Tread yoga socks are unisex and come in one size that fits sizes 8-13 for women and 7-12 for men. And their fun patterns and colors will make for a great family look. Dotted nubs at the bottoms often tend to hurt sensitive feet at first and might feel uncomfortable for some people. 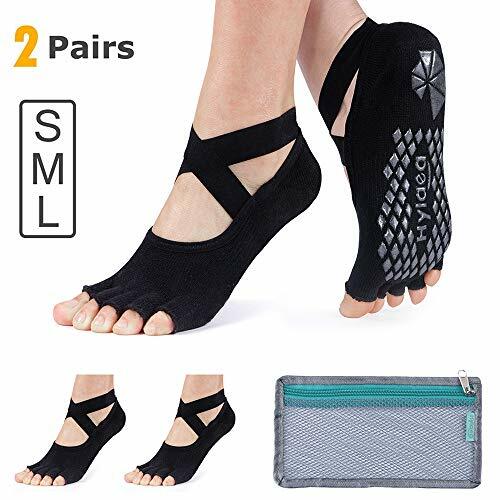 If you are one of them, there’s no need to refuse yourself the extra comfort and safety provided by yoga socks because Ellaste yoga accessory offers an alternative solution. These yoga socks feature flat anti-slip skids on the bottom designed to imitate the shape of your foot for the exceptional traction with the mat or floor. Made of the soft and elastic bamboo blend, Ellaste yoga socks breathe and wick away sweat to keep you dry as well as keep bacteria and bad odor at bay. A half-toe design offers a barefoot sensation and is perfect for yoga and Pilates. 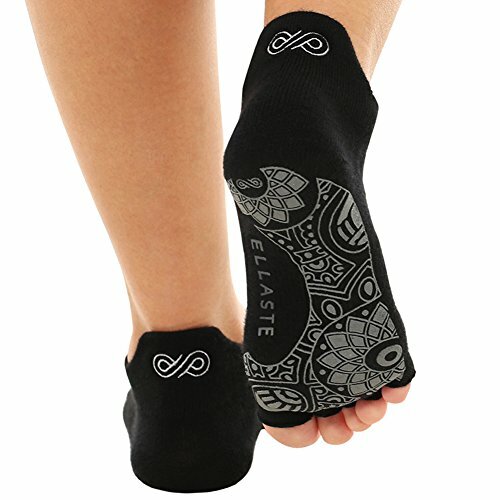 Ellaste yoga socks come in several sizes as well as colors and will make a great addition to your practice whether you’re a male or female sports enthusiast. Yoga socks are not a must-have accessory, and they still have lots of opponents. There are even cases when some yoga instructors strongly advise you to take off the yoga socks during the class just because there’s a risk that you’ll compromise your alignment and form – instead of applying pressure in the right areas, you’d be relying on the grip of your socks. There are also some other yoga accessories which work better for certain types of yoga. For example, if you’re seriously invested in hot yoga, it might be more practical to buy a full mat yoga towel with rubber nubs instead of grip socks since it won’t be just your feet that will be sweating. Thus, it’s hard to judge whether yoga socks are worth the investment since everything is individual. Whether it’s yoga, Pilates, barre or any other practice, you should always go for what works for you. For me personally, yoga socks are a fantastic accessory for keeping my feet warm during a more gentle flow. They also made a world of difference in my practice during frequent travels – I can’t carry my mat around the world all the time, but with the yoga socks there is always a moment for a spontaneous Downward Dog on any surface. I invite you to give yoga socks a go, try different styles and if none works for you – don’t force it. They won’t be left lying around anyway – a spare pair of grip socks will always come in handy for lounging around the house on a chilly day.